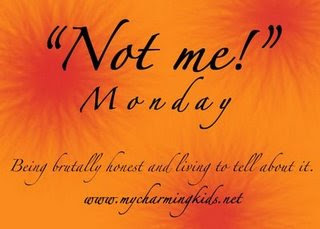 Welcome to Not Me! Monday! This blog carnival was created by MckMama. You can head over to herblog to read what she and everyone else have not been doing this week. I did NOT support our family Girl Scout by buying five boxes of cookies. And I did Not consume an entire box of Tagalongs by myself yesterday, refusing to share with my hubby and hiding them from the kids. I did NOT book our weekend so that the kids were up past ten o'clock on both Friday and Saturday nights. And we did NOT decide to skip church yesterday, sleep in and stay in our jammies all day. I was NOT so excited about my new jeans that I felt the overwhelming need to wear them immediately. More importantly, I did NOT change my jeans in the parking lot of IHOP. I am NOT so out of shape that the two minutes of Jillian's workout I did on Friday made me sore for days. There's NO WAY I was groaning like an eighty year old just to sit down. "Mommy, you are supposed to touch your toes. You are not reaching your toes." "Well, I can reach my toes." "After this, do you want to eat an ice cream sandwich?" "I can do this much faster than you." "How come you are breathing so fast? I am not breathing fast!" I did NOT allow Emma to then play with play-dough in her carpeted bedroom, just to get rid of her, I mean, keep her occupied for a while. Well since you didn't do a workout this morning I won't wish you luck in being able to sit down to pee, and to be able to stand back up when you're done!! Hey~will I ever get to meet your baby?! I have a gift here for him I need to mail, before he outgrows it (or maybe he already has!) I am NOT a procrastinator!!! Love ya! Hahaha, great stuff. If it makes you feel better, the last time I did some leg lifts I could barely walk the next day.